While Guillero Del Toro never got the chance to make a third Hellboy live action film, Hellboy did live again in animated form and now, with the reboot about to hit theaters soon, Lionsgate bundles the two features together and gives them a 4k UHD release. 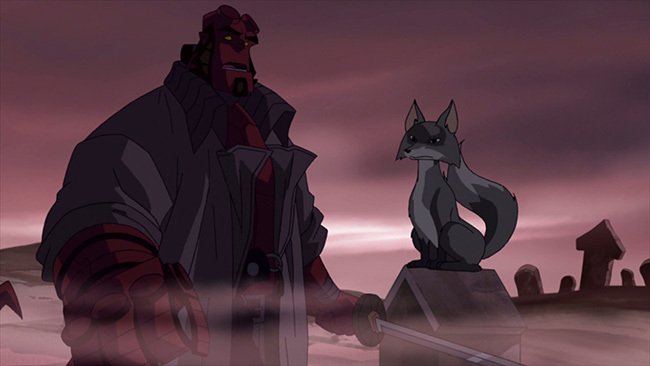 Del Toro and Hellboy creator Mike Mignola produced these two movies and they managed to get the cast members of the orignal two features to do the voice work, so these are very much in keeping with what has come before. 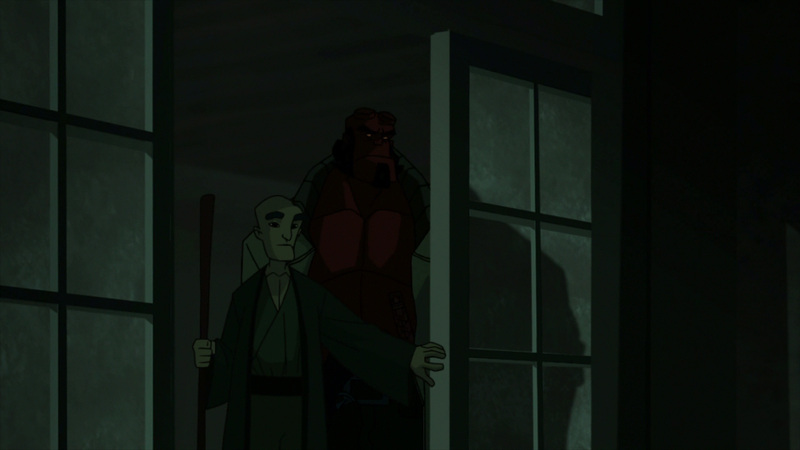 The first story beings with folklore Professor Sakai becoming possessed by the Japanese demons of Thunder and Lightning! Hellboy and The Bureau of Paranormal Research and Defense (B.P.R.D. for short) are called in to investigate and, in the course of their duties, Hellboy winds up messing with a cursed Samurai sword that whisks him off to another dimension. 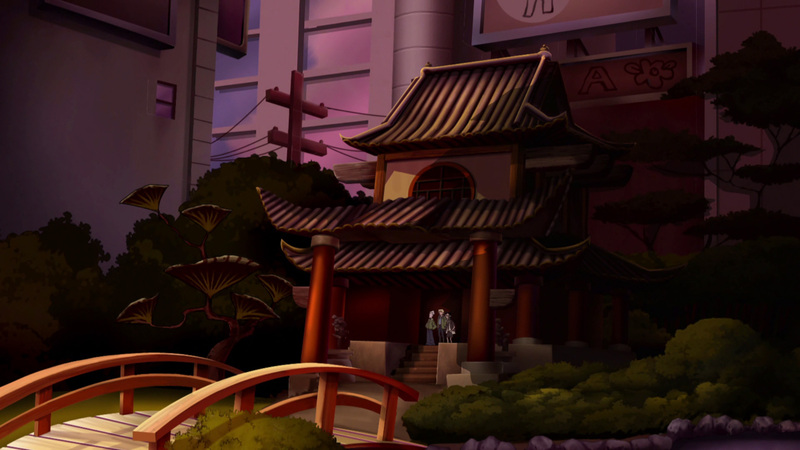 And it’s not a very nice dimension either, as it’s full of ghosts and monsters and seems to be some sort of strange version of what was once Feudal-era Japan. 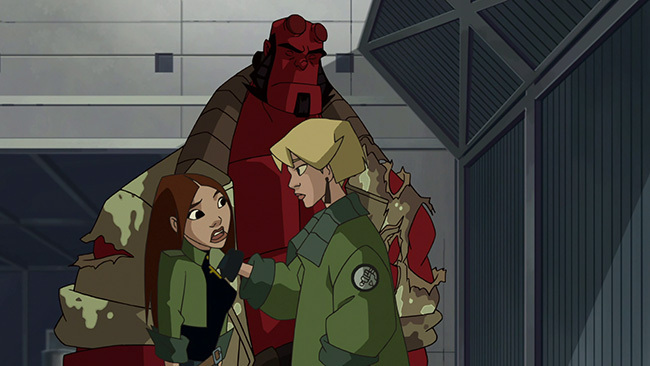 Enter pyrokinetic Liz Sherman and fish-man Abe Sapien, who wind up having to do battle with an angry dragon, while an increasingly grumpy Hellboy has to figure out how to get back to his proper dimension without getting killed by his newfound supernatural adversaries. The way to do it? 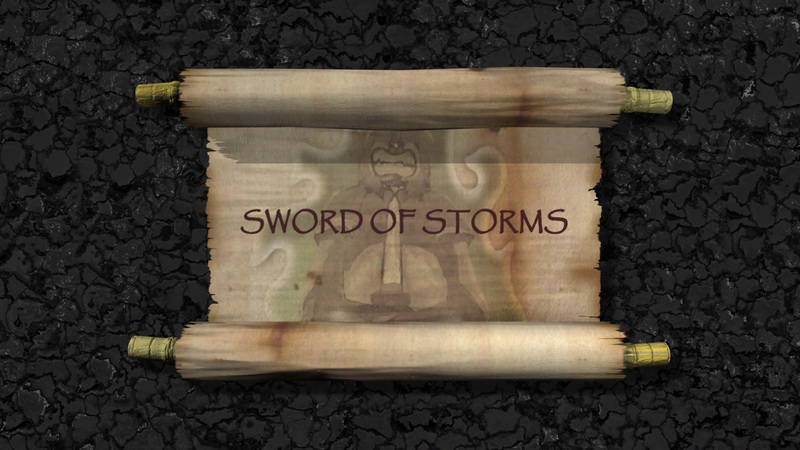 Break the sword, but if he does that, he’ll Thunder and Lightning, and that would be very bad indeed. 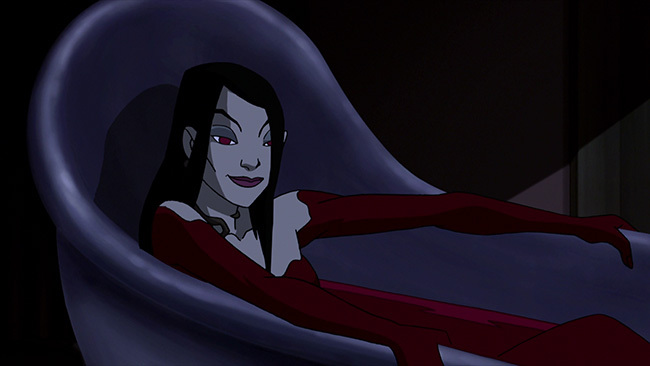 This is a pretty fun time waster made all the better by the voice work of Ron Perlman, Selma Blair and Doug Jones, each of them doing a very good job of breathing some life into their animated counterparts. 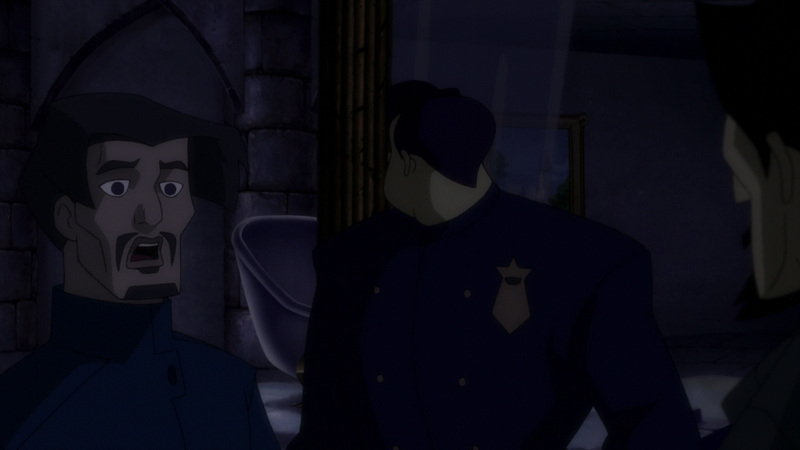 The animation style here isn’t particularly complex, in fact it’s almost minimalist, but it works in the context of the story. 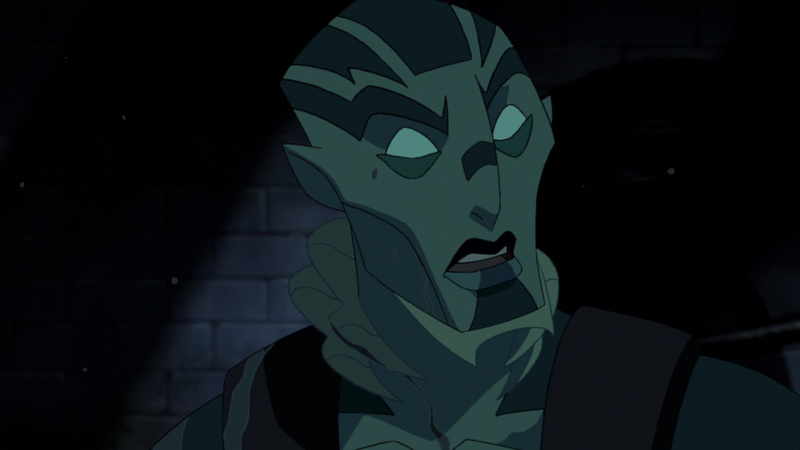 While some could rightly argue it might be better if it looked more like Mignola’s distinctive comic book style, the fact is that the visuals here are solid and that they work. 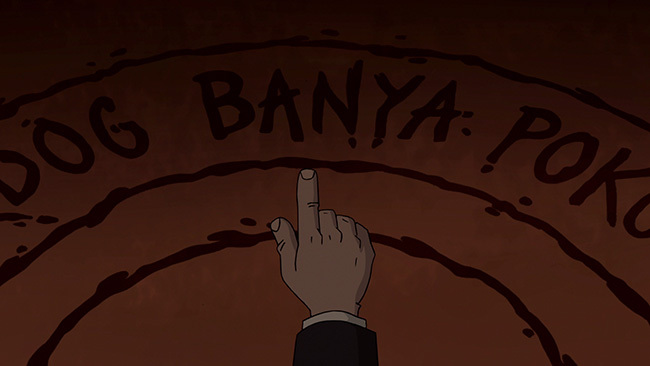 The story itself is quirky and creative, the right mix of humor and horror, and tossing the B.P.R.D. 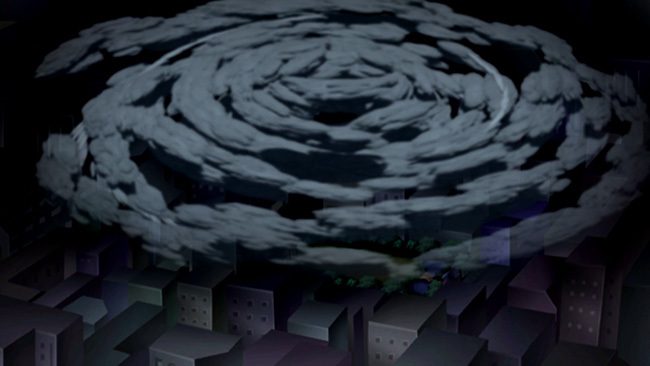 into the world of Japanese ‘yokai’ folklore proves to be a good fit. In the second story, Hellboy, accompanied once again by Liz Sherman and Abe Sapien as well as Sidney Leach, is tasked with investigating the mansion out in The Hamptons belonging to an eccentric that is reported to be insanely haunted. Upon arriving, they meet Professor Trevor 'Broom' Bruttenholm (John Hurt). 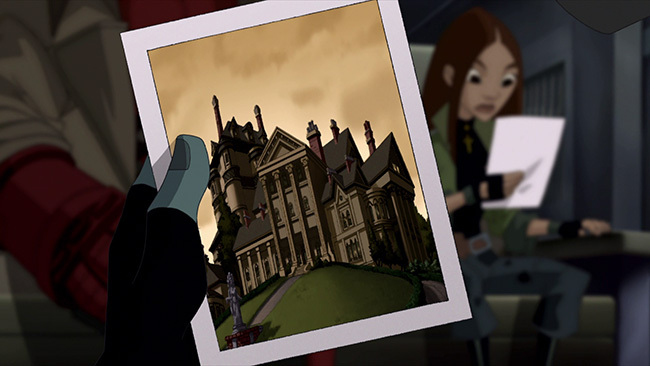 While doing their due diligence in this regard, and trying to get rid of the hauntings, they discover a bizarre scheme intended to bring back a vampiress with a connection to Professor Bruttenholm’s past. 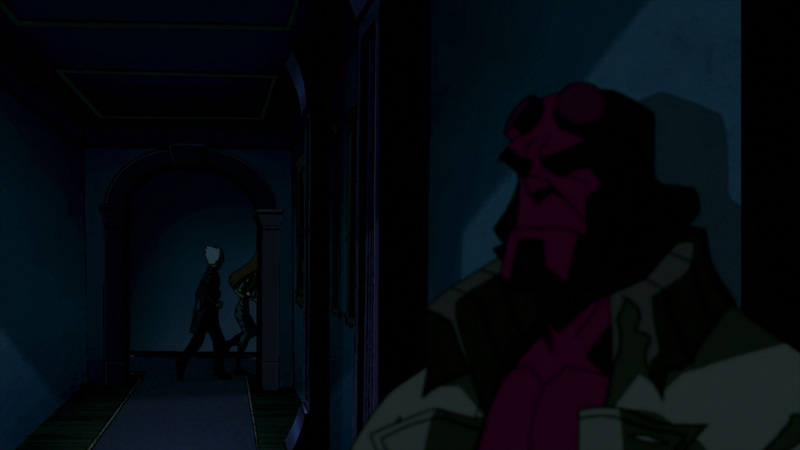 Of course, Hellboy, once he learns of this plot, decides he’ll make sure it never comes to fruition but before he can do that he’ll have to fend out of the countless other ghouls and ghosts that arrive on the scene. 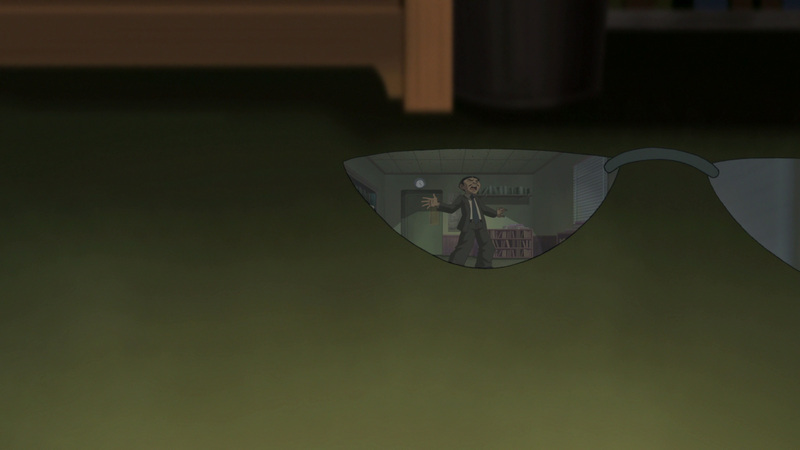 This second effort is, overreliance on flashbacks notwithstanding, also quite strong. Again, the filmmakers and creatives find the right balance and adding John Hurt to the cast doesn’t, ahem, hurt anything either (sorry). The visual style here matches that which we saw in the earlier effort but the story is more complex and more rewarding. 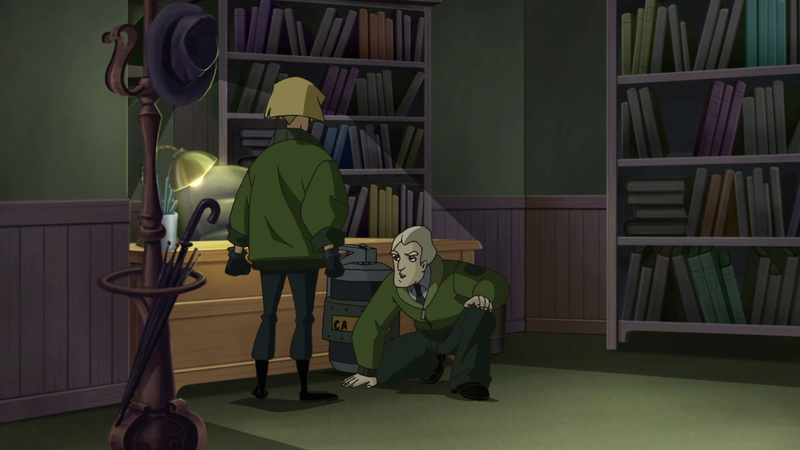 There’s also a lot of great creature and monster design work on display here that helps to keep it entertaining. Both features are presented in 2160p 4k high definition in HEVC / H.265 encoded transfers on a 66GB disc with HDR and Dolby Vision. This material is an odd choice to bring to UHD, as it isn’t native 4k content and the animation style employed in the movies isn’t super detailed, but we do get a noticeable boost if not in detail and depth with improved color reproduction. That’s the most noticeable factor when comparing the UHD with the Blu-ray version. Otherwise, there isn’t a massive difference here. The transfers are fine, the movies look good save for some occasionally noticeable jagged lines – but don’t go into this expecting a massive revelation or upgrade over the previous Blu-ray. The English language Dolby Atmos sounds excellent. Optional subtitles are provided in English and Spanish. A Dolby TrueHD 7.1 track is also included on the disc, but the Atmos option is the one to go with. There isn’t a massive amount of surround activity during every scene but there’s enough that you’ll be frequently immersed in the mix. Levels are nicely balanced and there’s good kick to the lower end, bass response is pretty strong here. Sword Of Storms features an audio commentary featuring Hellboy creator Mike Mignola, supervising producer/director Tad Stones and director Phil Winstein while Blood & Iron features a commentary from Mignola, Stones and Vic Cook. Both of these are pretty interesting, providing a nice mix of background on the characters and stories as well as their comic book origins mixed with details about what went into getting the stories made into animated features, working with the cast and crew as well as the animation team and more. 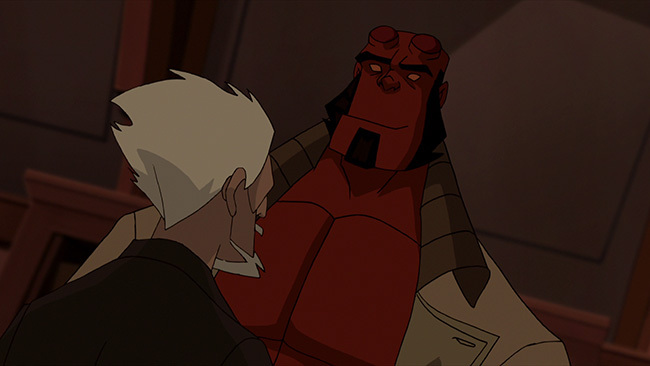 Featurettes start off with A New Breed: Creating The New Hellboy, which runs five-minutes and explores how the character had to be redesigned a bit to work in an animated world versus the live action and comic book versions he’s existed in before. 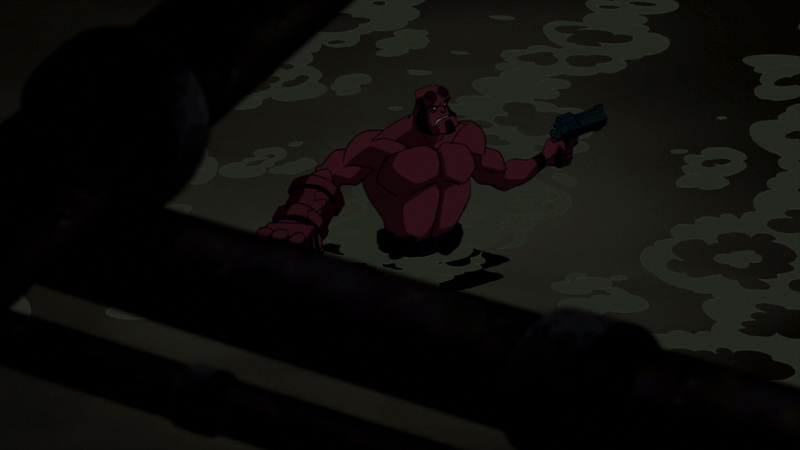 In Conquering Hellboy: The Actor’s Role we spend six-minutes with the cast members and learn what was involved in their voiceover work. We also get the five-minute A View from the Top: The “Heads” Sequence featurette that explores one of the more memorable set pieces from the first feature. The twenty-minute Reversal of Fortune: Professor Bloom’s Story is a featurette that lets you watch the flashback scenes from Blood & Iron in chronological order if that’s your thing. Tales from the Tomb: A Look Inside Blood & Iron is more interesting, it’s a thirteen-minute piece that serves as a basic, but engaging, behind the scenes piece. 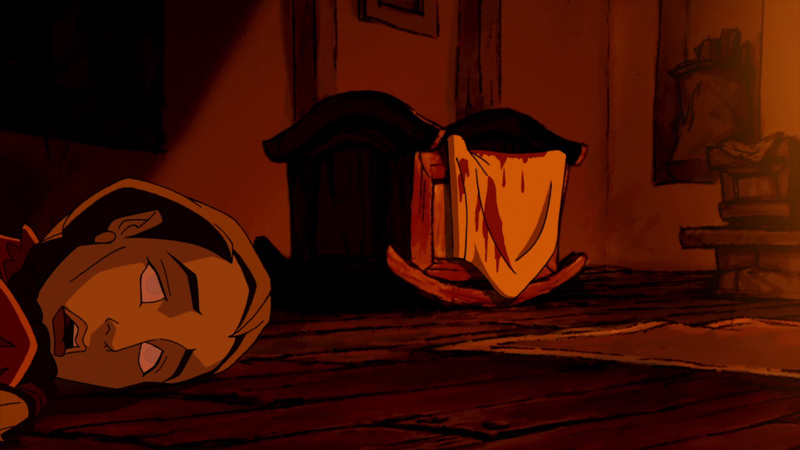 Also worth checking out is the Iron Shoes animated short that comes with a short introduction from Mignola. All of the extras have been carried over from the limited-edition Blu-ray release from 2008, there’s nothing new here, but the material is interesting and worth checking out if you enjoyed the two features. The UHD is bundled with a standard Blu-ray release that fits inside the black keepcase which also houses an insert card that contains a download code for a Digital HD version of the movie. The case, in turn, fits inside a slipcover. 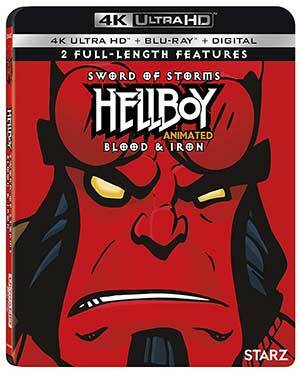 Lionsgate’s UHD/Blu-ray combo pack release of Hellboy Animated: Sword Of Storms/Blood & Iron doesn’t offer a massive upgrade but it does improve the colors in impressive ways and offer up an Atmos track as well as the extras from the out of print limited edition. 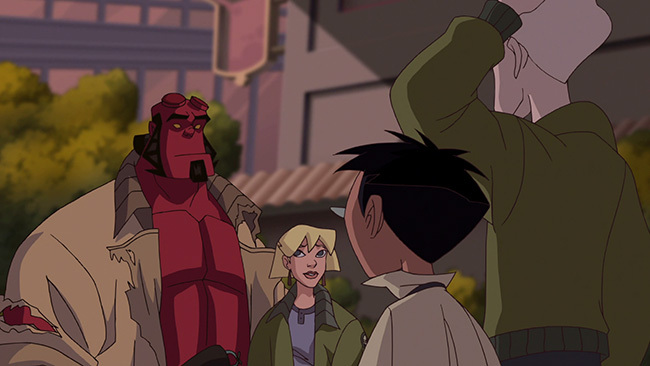 The movies themselves are pretty fun, quirky but engaging takes on the comic series that launched all of this. 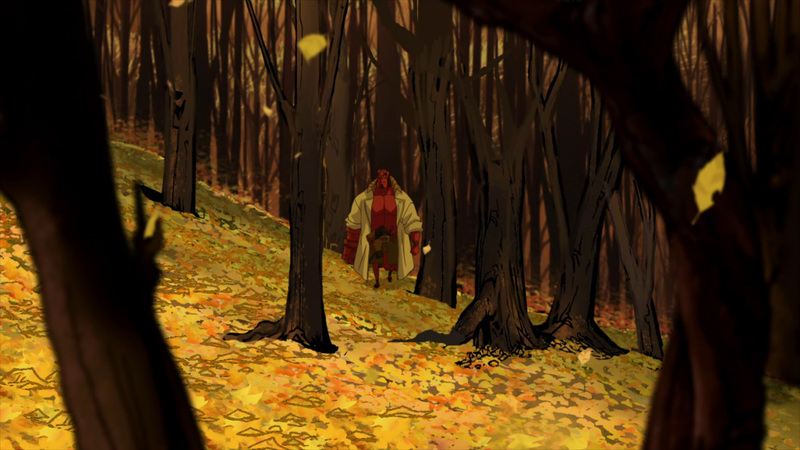 Click on the images below for full sized Hellboy Animated: Sword Of Storms/Blood & Iron Blu-ray screen caps! Sword of Storms was written specifically as an animated pilot, and some bits and pieces came from one-and-two page short pieces Mignola did in the comics over the years. 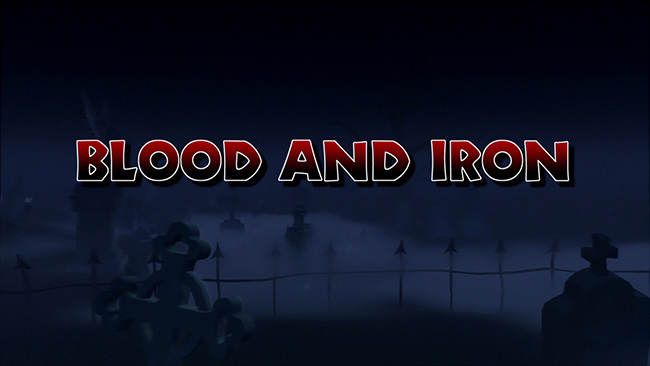 Blood and Iron is a direct adaptation from the comic of the same name, and is surprisingly accurate to the original. Both are great and well worth watching.